Hmmmm. Need we threaten a stampede of fat cats? Not a pretty sight! I worked on my nephew's small layout, which is the one that I made with A Shark in the Corner. 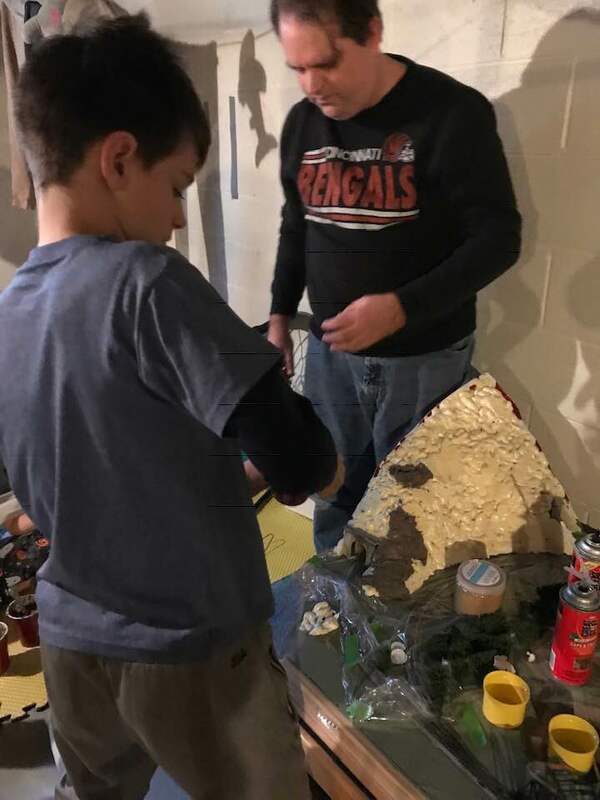 We have been working on adding a mountain and tunnel, and this weekend was the fun part of adding ground goop on top of the expanded Great Stuff foam. Might be time for a "Reverse Moose Stampede"
You know, you could just follow his links??? which is the one that I made with A Shark in the Corner. Looks like you better duck! I think there's about to be a shark attack coming from behind your right shoulder!! Well, there's the links, ya know, with da photos, yeah, those photos you'd expect to see in da links... Sheesh! But links are not pictures are they? No..... but if you follow them, you will find the pics, but I guess that's too much like work? Finished the decalling on this gondola. Used the Michael Livingston decals I found, umm somewhere. They were easy to use but a little easy to rub off. No river counting please, I realized later it’s not the exact model but it’s close enough. I count zero rivers in that photo. Looks good! I don't see any decal film edges, it looks factory-printed. How are you making those? What are they made out of? Are you upcycling something or injection molding plastic cases? some cut-to-fit PVC plates and the inserts from the jewel cases the cars came in, stuck onto the PVC plates with double sided tape. Yeah, storage is one point, transportation to module meetings and quick unpacking/repacking is the more important one. I brought 39 tank cars with their jewel cases to a meet at the beginning of this month, it's a lot of work to unpack/repack them. For reefers, boxcars, hoppers I just have cable channels with foam inserts, but tank cars with all their platforms and ladders and piping are going to loose all their details in that kind of transportation. Hmmm Half Steam Half Deisel with the Deisel edging out ahead (in foreground of shared photo, had to look for the Steam). I would of pictured it earlier in the transition era if not before.